The aim of this study was to estimate the heritability of quantitative measures of glucose regulation obtained from a tolbutamide-modified frequently sampled IVGTT (t-FSIGT) and to correlate the heritability of the glucose-stimulated beta cell response to the tolbutamide-induced beta cell response. In addition, single nucleotide polymorphisms (SNPs) having an exclusive effect on either glucose- or tolbutamide-stimulated insulin release were identified. 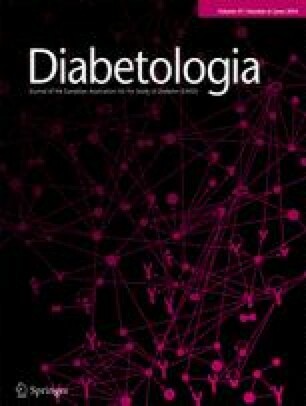 Two hundred and eighty-four non-diabetic family members of patients with type 2 diabetes underwent a t-FSIGT with intravenous injection of glucose at t = 0 min and tolbutamide at t = 20 min. Measurements of plasma glucose, serum insulin and serum C-peptide were taken at 33 time points from fasting to 180 min. Insulin secretion rate, acute insulin response (AIR), disposition index (DI) after glucose and disposition index after tolbutamide (DIT), insulin sensitivity (SI), glucose effectiveness (SG) and beta cell responsiveness to glucose were calculated. A polygenic variance component model was used to estimate heritability, genetic correlations and associations. We found high heritabilities for acute insulin secretion subsequent to glucose stimulation (AIRglucose h 2 ± SE: 0.88 ± 0.14), but these were slightly lower after tolbutamide (AIRtolbutamide h 2 ± SE: 0.69 ± 0.14). We also estimated the heritabilities for SI (h 2 ± SE: 0.26 ± 0.12), SG (h 2 ± SE: 0.47 ± 0.13), DI (h 2 ± SE: 0.56 ± 0.14), DIT (h 2 ± SE: 0.49 ± 0.14) and beta cell responsiveness to glucose (h 2 ± SE: 0.66 ± 0.12). Additionally, strong genetic correlations were found between measures of beta cell response after glucose and tolbutamide stimulation, with correlation coefficients ranging from 0.77 to 0.88. Furthermore, we identified five SNPs with an exclusive effect on either glucose-stimulated (rs5215, rs1111875, rs11920090) or tolbutamide-stimulated (rs10946398, rs864745) insulin secretion. Our data demonstrate that both glucose- and tolbutamide-induced insulin secretions are highly heritable traits, which are largely under the control of the same genes. Anette P. Gjesing and Malene Hornbak contributed equally to this study. The online version of this article (doi: 10.1007/s00125-014-3207-y) contains peer-reviewed but unedited supplementary material, which is available to authorised users. The authors would like to thank A. Forman, B. Andersen, G.J. Klavsen, T.H. Laurentzen and M. Modest (Steno Diabetes Center, Gentofte, Denmark) for their dedicated and careful technical assistance, and G. Lademann (Section of Metabolic Genetics, University of Copenhagen, Copenhagen, Denmark) for secretarial support. The study was supported by grants from the Danish Medical Research Council, the University of Copenhagen, an EEC grant (BMH4CT950662), the Velux Foundation, the Lundbeck Foundation Centre of Applied Medical Genomics for Personalised Disease Prediction and Care (LUCAMP; http://www.lucamp.org), the European Foundation for the Study of Diabetes (EFSD) and the Danish Diabetes Association. The Novo Nordisk Foundation Center for Basic Metabolic Research is an independent research centre at the University of Copenhagen partially funded by an unrestricted donation from the Novo Nordisk Foundation (http://www.metabol.ku.dk). TH and OP hold personal shares in Novo Nordisk. The remaining authors declare that there is no duality of interest associated with this manuscript. MH, APG, CTE, SAU, HE, OP and TH contributed to the conception and design of the study. MH, APG, KHA, OP and TH contributed to the analysis and interpretation of data. The first manuscript was written by MH and APG with equal contribution and the final draft was finalised by MH, APG, KHA, CTE, SAU, HE, OP and TH. All authors have revised the manuscript critically for important intellectual content and approved the final version of the paper. TH is the quarantor of the study.